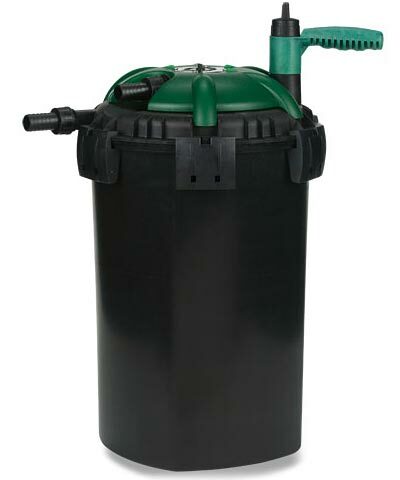 Keep your pond water clear with help from the Little Giant BioVort Pond Filter. This biological filter combines mechanical and biological filtration to offer you the latest in pond cleaning systems. Filtering your pond keeps the water clean and aerated, leading to a healthier balance of nutrients within it. Six sturdy latches connect the lid to the base of this filter, keeping it securely attached throughout use. An inlet and outlet on this lid allow water to easily enter and exit the filter, and a backwash arm enables you to thoroughly rinse the unit as needed. The included O-ring secures the item together, helping prevent leaks. The tall filter houses sponges and plastic screens to trap solids, while the base is full of included bio-balls. These media offer several places for beneficial bacteria to grow, for clean and healthy water. The bacteria convert harmful nitrites and ammonia into beneficial nitrates before the filtered water is released back into the pond. Place this filter in the ground next to your pond, ensuring the inlet and outlet can be easily accessed, for an effective system. Two 1" hose adapters, a handle for the agitator arm, and a cap to close either the inlet or outlet when needed are included, for easy setup. Pair this BioVort Pond Filter with an appropriate pump for a fresh, clean water feature year after year. Three year limited warranty.